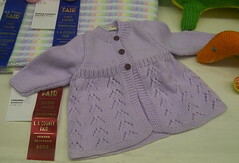 The County Fair opened this weekend, and I made a trip over there this morning. 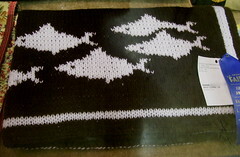 Since I was by myself, I could spend lots of time poking around the Tapestry displays. 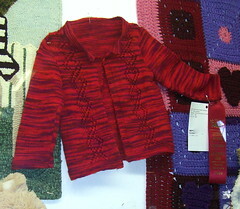 I thought it would take some time to find my entry, but it was pinned up in a case right near the door. 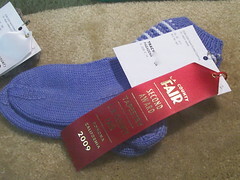 Looks like I got a Second Place ribbon, but I’m a little puzzled about the ribbons. 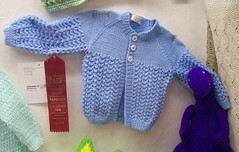 I hunted down the other entries in the Infant Handknit Sweater category. All red ribbons, except one. As always, I’m mystified by the entire arrangement of the Tapestry entries, but they seem to have had a display designer this year who was particularly unclear on the concept. 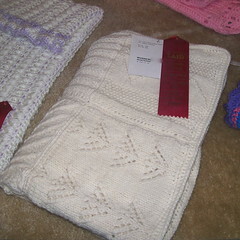 The knitted and crocheted afghans were almost all displayed folded up. 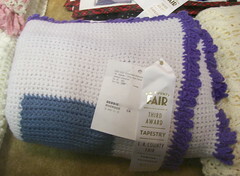 This looks like a lovely sampler afghan, but we get no idea what it looks like. The tag on this one says something about a boat. This is Eeyore. I know this because it says so on the tag. 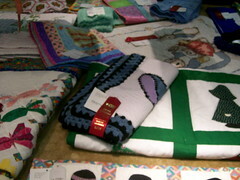 Most of the afghans were on the floor of displays, under beautiful hanging quilts. 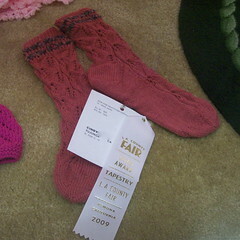 Next year, I’d like to enter some socks. 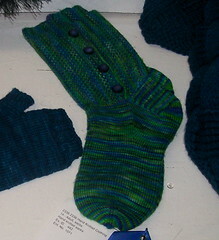 I knit socks more often than anything, but I always want to wear them right away! 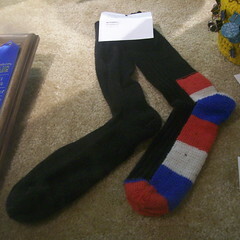 There were quite a few socks entered, and I’m not sure how many subcategories there were. I don’t know how they decided it would be a good idea to cover up the color on the cuffs and display the stockinette feet. This looks like Embossed Leaves with some added embellishment on the cuffs. 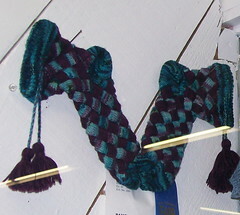 Entrelac socks, I think. I don’t know if that was a separate category or not. 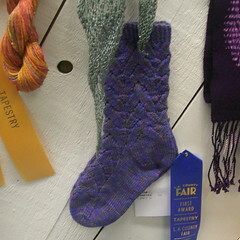 I didn’t see any other entrelac socks, although there was a Lady Eleanor stole on display. 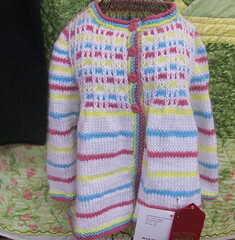 There were also lots of adult and child sweaters on display, and some lovely shawls. 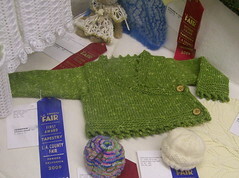 After much searching, I located the Best in Show for Hand Knit Clothing. 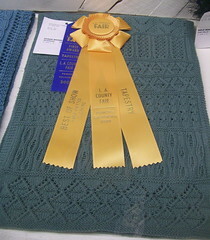 According to the tag, it was entered in the Shawls/Wraps category. I’m sure it’s fantastic. It would have been nice to be able to see it. Ugh! The displays this year seem to be worse than the previous years. I suppose they just don’t have enough room to display all of the afghans…too bad they’re clued into quilt display, but not afghans! I wonder if there’s an e-mail where we could all question this division’s displays? 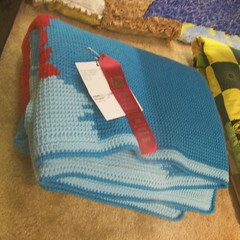 Congrads on your 2nd Place ribbon!